Google co-founders, Larry Page and Sergey Brin have uploaded a .txt file on its own servers that tell the T-800 and T-1000 Terminators to "disallow" their deaths. If movies are anything to go by, the world will eventually be overrun by either zombies or killer robots. Now, if it's the latter, then it seems Google co-founders Sergey Brin and Larry Page have already thought of way to survive by taking a precaution. The duo has uploaded a "killer-robots.txt" file to its servers which instructs the T-800 and T-1000 Terminators (from the Terminator movie franchise obviously), to "disallow" both of their deaths. This little nugget on Google's website was made to coincide with the "Robots.txt" file's 20th anniversary. Created in 1994, the tool instructs search engines and other automated online bots to ignore certain pages or directories of a site. Up to this day, major search engine giants such as Google, Bing, and Yahoo still obey the order. Of course, Page and Brin are only safe if Skynet follows their directives. And if the movies are anything to go by, is there anyone really safe from Terminators? For more Terminator stuff here on The Escapist, the movie's reboot will reportedly feature time travelling robots and will once again star Arnold Schwarzenegger. 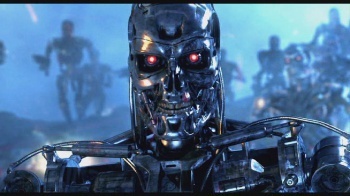 What steps have you taken when the inevitable killer robots have overtaken the world? Or should we be more concerned with the zombie apocalypse?